From naked assembly to fully covered, these progress photos show how quickly a vertical garden tower is fully 'dressed. What’s Holding Back Green Infrastructure in Australia? Will a Robotic Plant be the next 'must have' for your home? 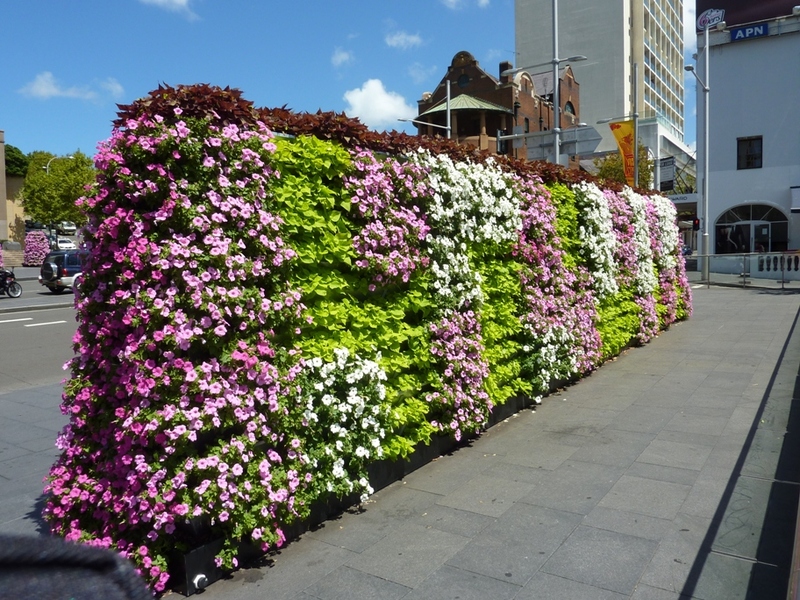 Will Botanists Soon be Involved in the Designing of City Greenwalls? Greenwall Systems: Soil based or Hydroponic? Vertical Garden and Greenwall systems are rapidly growing in popularity due to their ability to bring the healing serenity of Nature back into the life sapping madness of our ever expanding urban environment. Greenwalls naturally purify the air and have now been proved to reduce a building’s heating and cooling costs. With so many options available it can be difficult to decide which kind best suits your needs but one of the first decisions you'll be faced with is whether to ‘go hydroponic’ or not i.e to grow in soil or water? I am biased towards one type of Greenwall system in particular but my views may at least encourage you to ask the right questions if you are undecided. Hydroponic Greenwall Systems deliver nutrients to plant roots via water not soil. Small scale Greenwall systems for domestic use can be relatively easy to maintain, even though they still require a constant power/water supply. However, larger hydroponic systems can be quite complex to install as well as more expensive to ‘run’. Here are a few basic factors to consider when trying to decide which Greenwall system is for you. If you ‘think like a plant’, the decision will be easy and maintenance looms large as a deciding factor for me. A soil based Greenwall system's natural ability to retain and evenly distribute water makes it more water conservative and much easier to maintain than a hydroponic Greenwall system, especially if hand watering is an option. With hydroponic systems, a constant flow of clean, aerated water and nutrients is required to keep your plants thriving. The irrigation methods in large scale hydroponic Greenwall systems can be quite complicated and require frequent expert attention. Pump failure without backup power could see plants die in a matter of hours whereas a soil based system is more forgiving should irrigation stop, with a window of days for survival rather than hours. Another challenge you face with hydroponic Greenwall installations is maintaining water temperature and pH levels which are extremely important for plant health, especially outdoors in warm climates. Changes in water temperature will affect your plants ability to survive. A soil based Greenwall system consumes less water, does not have to use recirculated water and allows for more irrigation options which help to stabilize moisture levels and temperature of the soil. Plants naturally produce incredible root systems to anchor themselves to whatever they are growing in, whether this is on rocks, in soil or in synthetic materials like those found in hydroponic Greenwall systems. One problem that can occur when using a hydroponic system is that the plants may not create a strong enough root system to be sturdy and often need weeks of ‘training’ to defy gravity after being plugged into the vertical Greenwall ‘horizontally’. A soil based Greenwall system with a large root space encourages the growth of an extensive, strong root system and the plants grow in their natural ‘vertical’ plane from the start. The price you pay for this bonus though is that the soil based Greenwall system will probably be heavier than the hydroponic one so check that your wall/fence/deck can take it. Even expert botanists occasionally struggle with the proper balance of nutrients for their plants, regardless of whether these grow in soil or water. This is especially true in hydroponic Greenwall systems in which a balanced solution of nutrients must be added to the water at specific times throughout the growth period. Even the smallest fluctuation at the wrong time can destroy plants in a matter of days. Soil based systems are much more forgiving in this area. The soil acts as a natural buffer and plant pantry, absorbing excess nutrients yet providing them to the plants as needed. Another vital factor for success with hydroponic Greenwall systems is the need for the right amount of oxygen at root level. Plants can die of suffocation due to anaerobic activity caused by mismanagement of irrigation, nutrient mixes and microorganisms. In soil based systems, oxygen is supplied through a natural process – it becomes aerated by hard working little microbes giving the roots the TLC they need. Combatting pests and disease is an ongoing problem for any gardener. Soil based Greenwall systems are more resistant to the spread of disease than hydroponic Greenwall systems and can therefore be less risky. In hydroponic systems, where the plants’ roots are more exposed to water that constantly recirculates, algae/bacteria can quickly travel to all plants via the system’s irrigation superhighway. Root rot or ‘pythium’ is almost impossible to eradicate even with extensive disinfecting. Something as simple as unsterilized tools is enough to bring your hard work, as well as your emotional stability crashing down in a couple of days. Hydroponic Greenwall systems require electric pumps to recirculate water from a reservoir at the base to carry nutrients to all the plants. Due to the sensitive nature of a hydroponic Greenwall system, a power failure could be devastating. With a soil based system, you have the option of regularly hand watering your plants with ‘fresh’ water and allowing the soil to carry the water throughout the system, reducing risk of water borne disease. Timers and pumps can be used in soil based Greenwall systems too but only intermittently as needed. Unless it's installed indoors where lights may be needed, hand watering your soil based Greenwall can eliminate the need for a power source all together. Maintenance is one area where soil based Greenwall systems really shine. Undemanding irrigation, fertilizing twice a year, some tip pruning and replacement of the odd plant now and again means you can spend more time enjoying your lush Greenwall than tending to it. The constant demands of cleaning parts and monitoring nutrient mixes for a hydroponic system are enough to make you revisit toddler training techniques –with no pay off. Owners of large scale hydroponic Greenwall systems usually hire a professional team to maintain their Greenwalls which adds to the ongoing cost. Soil based Greenwall systems require much less maintenance since they're able to regulate water evaporation and nutrient delivery somewhat on their own. While hydroponic Greenwall systems have their advantages, especially in large corporate settings, many people prefer the hands-on nature of a soil based system. 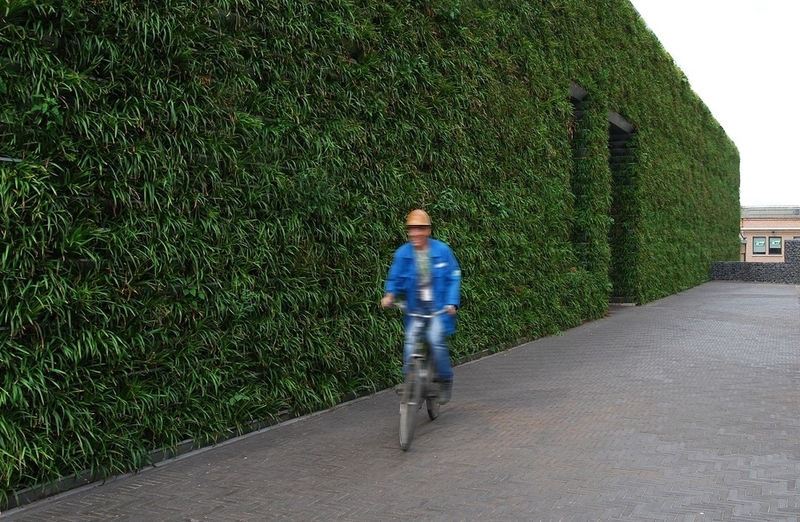 I think this type of Greenwall system is cost effective, easy to maintain, enables multiple use and allows for that personal interaction that gardeners seek and love. After all, what fun is growing plants if you can't play in the dirt? If you really want expert information on hydroponics, fill in this form to receive an excellent free article 'The Truth about Hydroponics'. Remember when you were in school? Maybe they were the best or …well, most “tricky” years of your childhood. Even if recess and lunch were your best subjects, you may recall the Hanging Gardens of Babylon. 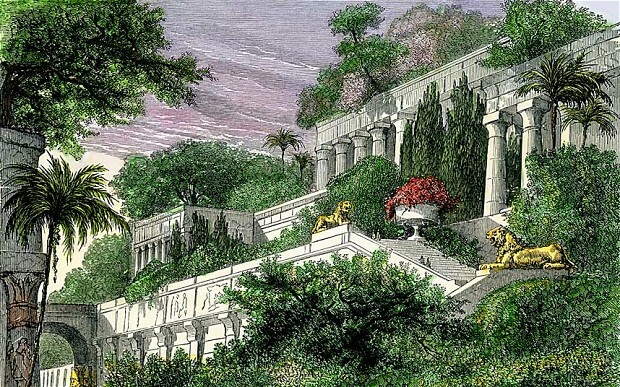 How could you forget that gift of terraced greenery King Nebuchadnezzar built for his wife? Even if what we learned in school may actually turn out to be wrong (the vertical gardens might have been built by the Assyrians and NOT the Babylonian king), you can create your own horticultural wonder that just might astound historians of the future. The Hanging Gardens of Babylon were the first documented vertical gardens- those terraced walls of splendid greenery impressed Strabo so why not trigger the same wonderment on your own palace grounds? Don’t forget to carve your name in rock and add a few meaningful symbols - archeologists love to put stories to those doodles! In order to impress your neighbors with your ancient historical knowledge, you must first construct your hanging garden, which is much easier to do today than it was in 700 BCE. We now have plastic and steel and even felt made from recycled plastic bottles to use for vertical garden systems that we can buy ‘off the shelf’. Living Architecture: the impact that a wall of flowers, herbs and foliage adds to your property is stunning. If you have a small space, you increase your growing area incrementally along with amazing visual drama. Even in larger gardens this vertical growing area breaks up the horizontal norm and affords the landscaper a way of adding instant height to a design (previously difficult when a client is impatient to see things grow tall quickly!) This combination doubles and triples the space available for ornamental plants as well as for food producers. Use a Vertical Garden as a plant nursery: if you are pressed for space or want to keep your seedlings in a compact area, try using a greenwall. You can place the sun lovers on the top and crops like lettuce or peas under the “eaves” of the older plants and the sunbathers. Use the greenwall as a growing system, reserving sections for transplants and microgreens. Large root zones conserve water and limit the watering chore. Create a dual-purpose (or triple) production space by planting herbs, ornamentals and “crop” species such as peas or peppers. Let strawberries and tumbling tomatoes trail down around the mini-roses and lavender. Ease of Use: for those with physical limitations or who have difficulty bending, traditional horizontal plots can be challenging to work. Transferring those plants to the greenwall allows ease of access from initial planting (and daily maintenance) to harvesting. Children love the novelty of vertical gardening. Consider erecting a small greenwall just for the children to grow their own plants in. Privacy: if you don’t want nosy neighbors (like Strabo) monitoring your business, a vertical garden is a screen of beauty. The vertical growing space is more lush than a fence and it offers you the added benefits of providing a garden. Use the greenwall to hide unpleasant necessities like the compost bin or the pool filter. Event and holiday tips: Get “festive” by stringing lights and inserting baubles or decorations for a birthday party or special dinner. Adding lighting to vertical displays is particularly stunning. Try battery-operated tea lights. Use seasonally appropriate decorations for holidays, even Easter eggs can be hidden in there! Show off your special collection of plants: Grow unique species in your greenwall or reserve the vertical garden for mono-culture, micro-climate or regional species. You could have a succulents exhibit and invite your local gardening club to a ‘show and tell’ coffee morning. Hmmm, I wonder what Nebuchadnezzar used for aphids and scale? So which Greenwall is for you? With the popularity and versatility of vertical gardening systems, there are now several designs of greenwalls on the market for both aesthetic features and productive gardens. It is important to have an understanding of the strengths of each system so you can create the effect you seek, not only for the weeks after installation but in the years to come. Whether to choose a soil based system or a hydroponic one. Most vertical garden systems on the market have limited planting surface and must be attached to a wall. You DON'T dig in them! Garsy® Greenwall gives you a choice. GARSY® Greenwalls can be either wall mounted OR used as freestanding 'living furniture',allowing planting on all sides and affording traditional, 'DIG IN' gardening pleasure - perfect for food harvesting as well as a stunning talking point. What are you looking for in your vertical garden or Greenwall? What is your vertical gardening vision? If you seek a lush wall of living green for a stunning 'wow' factor that is low maintenance, this sturdy, steel system will give years of reliable performance. If you delight in physically ‘gardening’ you will find the Garsy® Greenwall a joy to plant and garden in - with easy access for those with limited physical abilities. A trowel is all you need to plant your favourite plants and of course, replace them as often as you like, as the seasons roll on. Yes, steel Greenwalls are heavier than lightweight plastic but the pay off is longevity, durability and reliable performance. Snip your fresh herbs and salad greens moments before dinner and enjoy the sensory benefits of greenery that a Garsy® Greenwall brings to the tiniest of courtyards or high density living environment. With a Garsy® Greenwall, you can instantly transform half a square metre of ground space into 2 square metres of gardening area or grace a building frontage in glowing green. We deliver across Australia, New Zealand and Tasmania. Call us on 03 8802 1378 if you'd like a price list or have a specific query about vertical gardening with the Garsy® system. In greenwall Tags which greenwall to choose? Sold in 22 countries worldwide - now in Australia and New Zealand. © Copyright 2015 Eden Now. All Rights Reserved. Trademarks copyright their respective owners.